4 Day Trial Period for “CASH” Option. We’ve heard your priceless feedback and here it is! For a trial period of 4 days, from the 28 Jun 2016 till 1 July 2016, we are enabling the cash option. We are expecting red hot demand, so get ready! So how does CASH work? 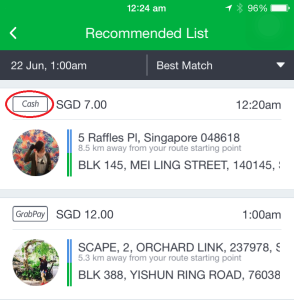 The first step to using GrabHitch is to create a route. You can do this by clicking on GrabHitch –> Driver –> Create Route. Once we know where you’re headed and when, we can suggest suitable passengers who are going the same way. 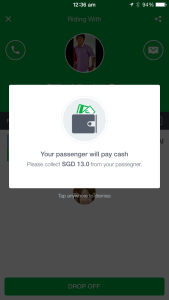 You will see the payment mode in the list of passengers that we have matched you with. When your ride is completed, select DROP OFF and you will receive a prompt to collect the appropriate amount. For CASH payments, no amounts will be credited to your wallet. Remember to collect CASH should you accept a CASH ride!